Screen Reader reads all elements menus or screen text pointed by mouse. This software has been done for people with visual troubles. When you launch application, a new icon appears in tray icon. To access options, just right click on the icon. 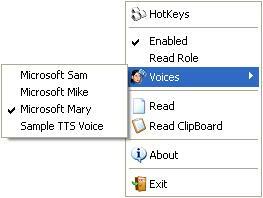 You can next select Screen Reader state (enabled/disabled), choose the wanted voice, define shortcuts and read raw data.